History: In Ecstatica, the first one, released in 1994, you stumbled onto a town in the clutches of an evil force. 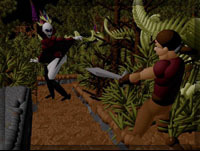 You bravely helped to defeat this evil force and returned home to your native village only to find the antagonist in the prior game has followed you home for revenge in Ecstatica 2. Produced by the same game house that did the first one. Psygnosis needs no introduction as one of the oldest and most reliable companies with Lemmings, and other classic products under their belt. The first Psygnosis game that I remember was Deep Space for the Atari 800, released in the early 1980's. Plot: Welcome home, brave warrior. After your adventures in the town where Ecstatica slept, you began your journey home. As you approach the castle of your youth, however, things appear amiss. An estate like yours would normally be bustling with life at this hour... Instead, you sense almost nothing - except an evil reek wafting to you on the morning breeze. Evil is back in the land. The Lord Demon did not take kindly to your saving Ecstatica. Now, he's back for you! Your goal is to prevent the Holy Seal of the Old Ones from being reformed in the shape of evil. The game Ecstatica is named after the woman the hero rescued in the first game. Starting the sequel she manages to get herself kidnapped again. Ecstatica must now be rescued again. An adventure game may be real-time it may be turn-based and Ecstatica 2 with its unique cartoon-like ellipsoidal graphics has real-time combat using over 12 attack movements, putting a fighting game within this animated graphic adventure. Like all adventure games Ecstatica has puzzles, which include treasure hunt puzzles which require you to find the right artifact, put it into inventory and use it in the correct way at the right time. The game has no inventory system which causes the most problems in trying to implement these types of puzzles. You can only carry what will fit into both of your hands, Ecstatica uses no pouches, belt loops, backpacks or even shirt or pants' pocketsfor storage. You cannot even wear inventory items, as in some games where your head, chest, torso, neck, wrists, and fingers can even hold items. 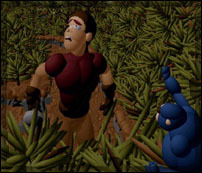 Another aspect of adventure games is exploration, and in this installment the protagonist, a young unnamed hero that we will call hero, must explore a castle, its courtyard, and the dungeons below the castle. The big question in everyone's mind is will that annoying werewolf be back to keep us on edge and dying? Movement is limited to side rolls, no side steps, front and back flips, move forward, back, and turn right or left. Fighting imploys evasion and using scrolls, magic rods, swords, and other artifacts. Graphics: Using an upgrade on ellipsoidal graphics originally introduced with the first Ecstatica. All the items in the land from including the main characters, monsters, and even blades of grass or leaves are ellipsoids or elongated spheres which move. The world is larger and the cinematic roving camera perspective is back with more views. Animation: There are no adjustable camera angles or side scrolling in the game. The animation is incredibly smooth and fluid and the animations are particularly nice to observe. Utilities: You can save at any time into any number of save games. There is no difficulty selector or difficulty matrix to make the game easier or harder to fit the skill levels of individual game players. Multi-player: There are no multi-player options for the game. Future plans: Look for Urban Decay to be the next thing on Andrew Spencer's plate. Journalists: Jason is predicting that the game will be one of the best, if not the best, of 1997. Jason D'Aprile, volume 3, number 12, May, 1997, pg. 84, 90%, CNP Preferred. Todd Vaughn, PC Gamer, volume 3, number 7, July, 1996, pg. 26-27.